Powers/Abilities: Mister Code has no superhuman powers, although he had a veritable army of followers that supported his cause and were ready to die for the cause in a heartbeat. Mister Code was skilled in the use of billy clubs and his body was wired to explode, should it be killed. He was also a skilled manipulator. (X-Statix#15 (fb)) - In Texas, Mister Code gave a seminar about his audience's lives being unhappy compromises and miserable trade-offs. 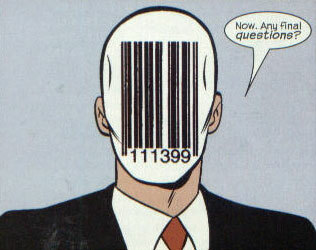 When he asked if anyone had any questions, one audience member in particular asked why Mister Code wore a mask with a barcode on it. Angered that a week of insecurity therapy had given him such a question, Mister Code hit a button underneath his podium that electrified the audience member, killing him. Afterwards, another audience member named Anthony asked Mister Code when they would begin to change America. Mister Code replied that there would be signs, as he looked down and noticed a young Spike Freeman, who had been funding Mister Code's seminars. (X-Statix#15) - In a random spot on the United States map, one of Mister Code's followers killed the mother of a young boy named Wayne, sniper-style, as well as various random people in the vicinity. 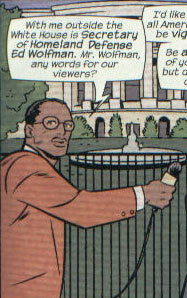 After the first killings, the news interviewed U. S. Secretary of Homeland Defense, Ed Wolfman. Mr. Wolfman urged the U. S. people not to panic while Mister Code watched on television and commented about the "changing of America" beginning. (X-Statix#15 - BTS) - Much later, in Milwaukee, another group of people were killed, sniper-style, under order of Mister Code. (X-Statix#16) - Mister Code's random killings continued as one of his lackeys killed a group of bowling enthusiasts with a car bomb. As X-Statix member Henrietta Hunter caught flack for not stopping the random killer and fulfilling her duty as the U. S. Secretary of Homeland Defense, X-Statix searched random places around the United States in a vain attempt to locate the random killer. After many more killings occured, a video containing the image of Mister Code appeared at a local news station. In it, Mister Code announced that America, where their ancestors carved America out of danger, had become fat and complacent. He also announced that the killings would continue until America had changed. Later, Spike Freeman called Mister Code at home and asked if Code could kill the mutant Lacuna, who had recently come into contact with documents that would ruin X-Statix. After the Orphan killed Spike Freeman due to his attempt on Lacuna's life, the Orphan rushed to save Lacuna. He arrived in time to see one of Code's henchmen shoot Lacuna. 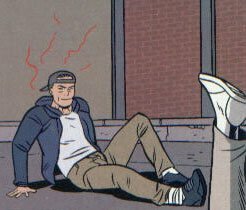 (X-Statix#17) - After Lacuna was shot, the Orphan levitated to the roof of her studio, where he found Mister Code's henchman. After a brief battle, the Orphan incapacitated the henchman, who exploded before giving the location of Mister Code. Eventually, the evidence against X-Statix was turned over to Lacuna's lawyers, who, in turn, gave them to the press. Deciding that the only way to redeem themselves in the eyes of the public was to take down Mister Code himself, X-Statix soon tracked Code down to his suburban stronghold, thanks to Dead Girl communicating with Spike Freeman's corpse. Teleporting into battle thanks to Venus Dee Milo, X-Statix confronted Mister Code head-on. Code soon gained the upper hand by knocking Venus Dee Milo unconscious and breaking the neck of Henrietta Hunter. The Orphan quickly grabbed Mister Code and levitated high into the air. Once high enough, the Orphan dropped Mister Code. Mister Code landed on top of a local home, crashed through the roof and was impaled on some of the debris. Wanting to find out who they were fighting, the Orphan removed Code's mask, causing him to explode. (X-Statix#18) - As Mister Code exploded, X-Statix member Phat jumped into action and used his powers to cover Code in his phatted-up skin. 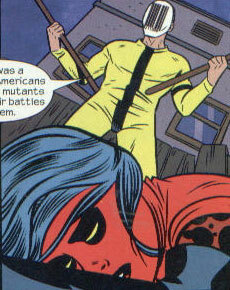 Phat's fat shielded X-Statix from Code's exploding body, but killed Phat in the process. X-Statix later went to a funeral for their fallen comrade. Anthony was one of the audience members of Mister Code's seminar in Texas some years ago. He asked Mister Code when they planned to change America. Presumably, Anthony ended up joining Mister Code's cause. Ben was a reporter who reported on the early random killings started by Mister Code. He interviewed then-U. S. Secretary of Homeland Defense Ed Wolfman. Rick, Sam, and another unnamed man went bowling one night and quickly ran to their cars after their bowling trip, in fear of the recent sniper killings. Making it to their car, the three men sighed a sigh of relief and turned the key. As the car started, it exploded, killing the three men inside it. They were the first victims of Mister Code to be killed by a bomb, instead of a sniper-style shooting. The unnamed gunman was one of Mister Code's followers and was hired to shoot down Lacuna, by order of Mister Code, who, in turn, was asked to do so by Spike Freeman. The gunman shot Lacuna as the Orphan was trying to warn her. The Orphan quickly levitated to the roof of a nearby building, where onlookers had seen the gunman. Arriving on the roof, the Orphan chased the gunman as he repeatedly shot at him. The Orphan then knocked the gunman to the ground, but before he could get any information, the gunman exploded. After the explosion, the Orphan removed the explosive device from the gunman's gaping skull. The unnamed gunman had no superhuman powers, aside from the explosive device implanted within his skull. Wayne and his mother were typical American shoppers who had just left the supermarket when a sniper shot and killed Wayne's mother, followed by another man behind Wayne. 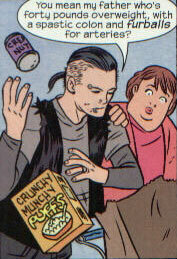 Before his mother was shot, Wayne had been arguing with his mom that both she and his father were overweight. His mother asked if the heavy metal music that Wayne listened to was telling him to act up and Wayne sarcastically replied that yes, Slipknot had been telling him to eat more nutritional foods. Ed Wolfman was the United States Secretary of Homeland Defense during the beginnings of Mister Code's random killing spree. When interviewed by a news reporter named Ben, he asked the United States to be vigilant, alert, and mindful of their surroundings. He also urged the people not to panic. After the killings continued, the news once again interviewed Ed Wolfman, who appeared sweaty and nervous. He then told reporters that he would resign. 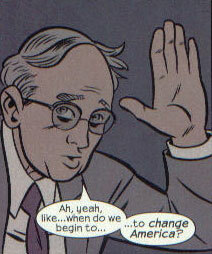 X-Statix member Henrietta Hunter replaced him as the U. S. Secretary of Homeland Defense. The Random Killers were all followers of Mister Code. On the order of Mister Code. They killed many Americans, mostly sniper-style but a few car bombings as well. The Random Killers, like their namesake, killed random Americans until Spike Freeman contacted Mister Code and had him order one of the Random Killers to shoot Lacuna. 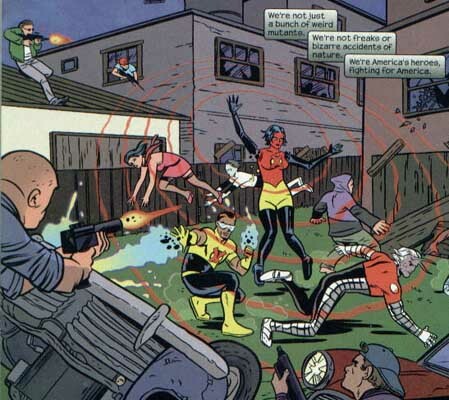 When X-Statix arrived in suburbia to stop Mister Code's killings, the Random Killers protected him to the best of their ability. Upon Mister Code's explosion, most of the Random Killers were presumably killed in the explosion.